In that place where you're more asleep than awake any more, I hear something else. A phrase uttered in a child's voice, no more than a whisper. Night Night. Sixteen year old Sunshine would follow her mother anywhere, even to the northwest corner of the country to live in a house rented straight from Craigslist. It's only ever been Sunshine and her mother, a nurse who's been offered a new position at the local hospital. She's the only parent she's ever known, after finding the newborn abandoned hours after being born. But Ridgemont Washington is little more than a small town shrouded in fog. Cold and dreary where the sun never shines. But Sunshine takes it all in her stride. She isn't worried about making new friends, having left her one and only best friend behind or being ostracised for her taste in vintage clothing and abundance of scarves, but rather the house itself. Their new home is dark, cold and reeks of mildew. But it's the sound of footsteps skipping across the floor and the tinkle of a child's laughter that has Sunshine on edge. Her mother is skeptical, but when Sunshine's room starts rearranging itself, her taxidermy owl coming to life, she knows that it's more than her imagination. Now she needs proof of the haunting. Even with photographic proof, her mother chooses to ignore her and her best friend thinks she's slowly going insane. The only one that seems to believe her is Nolan Foster, who's late grandfather's life work was proving the existence of ghosts. But this is no ordinary ghost and when Sunshine and Nolan start digging into the history of the house, they'll find more than they bargained for. She's always been unique but with Nolan's help, Sunshine is about to discover how different she truly is. 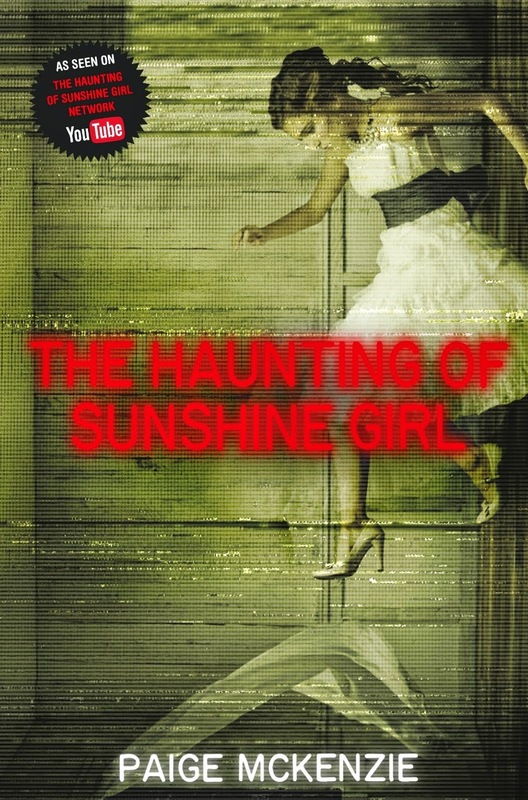 I love when a book surprises you, as The Haunting of Sunshine Girl did. I expected a mild paranormal, but what I ended up with was a quite creepy storyline that freaked me out on quite a few occasions. I hadn't heard of the YouTube phenomenon surrounding this book, nor have I seen the online clips but in no way did it hamper my reading experience and I really enjoyed it. Sunshine is adopted, just turned sixteen and moving across the country to what is essentially a haunted house. Imagine waking up in the middle of the night to the sound of footsteps skipping across the floor upstairs, a child's eerie laughter while she moves around your possessions. And she isn't the only spirit trapped within the house. The storyline is wonderfully written and kept me absolutely enthralled. The Haunting of Sunshine Girl won't keep you awake at night, but the hair on your arms will definitely be standing on end. My only complaint is the explanations throughout is presented in big blocks, not allowing the reader to fully absorb the information. But those are few and far between. I liked Sunshine, even if I couldn't relate to her. She's quirky and unconventionally cool. Nolan is a kindred spirit, he and Sunshine have a beautiful friendship and rapport, but it often leads Sunshine to wonder why Nolan is going out of his way to help when no one else seems to believe her. It was impossible to put down. Deliciously creepy and enthralling, I'm looking forward to seeing where the series leads. Recommended for fans of Anna Dressed in Blood or those looking for a mild horror while still maintaining their sanity. I read this and really enjoyed it! It was fantastic wasn't it Renee, I loved it's creepiness and the fact that it's main storyline wasn't overshadowed by the romance. I thought it was quite creepy, but I went into it not knowing anything about it really and my expectations were quite low. I think sometimes it's better to go in blind, that way you're pleasantly surprised. Hopefully if you continue onto book two, it'll much more enjoyable for you. Me too Alex. I actually didn't see that ending coming and it was much creepier than I had anticipated. Have you checked out the YouTube sensation as yet? I'm glad you liked this one more than you thought you would. That's always good. I do like a creepy read here and there. Same Lauren. There aren't too many mild creeping young adult titles around that don't have a huge amount behind them really. This one is superbly entertaining and was surprised how much I really, really enjoyed it. Would love to see what you think of it. I hadn't heard of it before either Paula before a copy arrived in the mail. I was in two minds whether to read it or not, as most horror really doesn't live up to the genre in young adult. But so glad I took a chance on it. I found it really entertaining and the parts with the bathroom scenes were really creepy and made the hair on my arms stand on end. Not one to read if you're easily scared. Can't wait to see your thoughts on it. It's super creepy isn't it. It's more creepy paranormal than horror though, enough to give you chills, but wont keep you awake at night. Definitely give it a try Claudia, I think you'll really enjoy this one. It sounds a lot creepier than it is, but there are some chapters where it really pushes into horror, depending on how creepy you like your young adult novels. I'm really looking forward to your review Eugenia, I think you'll love this one. I have a feeling you'll really enjoy this one Rashika, it's pretty mild, but really creepy in parts. It's a awesome, quick and entertaining read. I still need to check this out on YouTube as well. For fans of ANNA DRESSED IN BLOOD? YEP. I must read this one. It looks wonderfully creepy, and hey, who doesn't like a good ol' creepy read occasionally? I'm glad you liked it more than you thought you would. Thanks Kara. It really WAS creepy. I assumed it would be just another that promised to freak you out and fell flat. But I really, really enjoyed it. I like creepy too, which isn't creepy at all. I love that this one is creepy without the real horror factor in there. Even in young adult, that gets a little too much for this chicken. I never read Anna Dressed in Blood but i'm all for horror and I know so many people love the book i'd be willing to read something like this one! Great review Kelley! I can't wait to read this one! I can't wait to see what you think of it either Lily. It's very mild horror if that, more creepy paranormal. It's not as intense as Anna Dressed in Blood, but pretty close. I really enjoyed it. I have just recently gotten into audiobooks and I think this would be a brilliant book to listen to! I am so digging the YA horror this year and cannot wait to read Anna Dressed in Blood. Guess I'm adding The Haunting of Sunshine Girl to the list, too! Interesting that this is based on a youtube clip. I'll have to go check it out. Love when a book surprises me! Ooh, it really would be Sarah. I hardly ever consider audiobooks perhaps being better than the paperback but definitely going to check it out and see if it's available. Thanks Benish. It's not really scary horror, it certainly wouldn't keep you awake at night. But it has just the right amount of creepy to keep you turning the pages. I'd definitely give it a try, it might really surprise you. Thanks Amir. It's not a scary as it sounds, but super creepy at regular intervals. I need to check it out on YouTube still as well. I hadn't heard of it before, but now I'm eagerly awaiting book two already. Oh this sounds very creepy. Yep. Yep. Just gonna back away from it slowly hahah. And what Youtube phenomenon/clip/video? Is it directly related to this book? I will have to look it up I guess? Should I? Yes, you totally should. It's creepy, but not scary and won't keep you awake at night or jumping at shadows. I'm going to check it out today as well, hopefully we both really enjoy it poppet. Ooh what is this YouTube sensation you speak of Kels? The cover is awfully creepy, and just reading about creepy kids skipping and giggling is sending goosebumps up my arms. *shudders* I do like a good scare though so I would like to give this one a go. I didn't love Ann Dressed in Blood, but it was a decent read so I'm intrigued by this one. Lovely review! It's milder than Anna Dressed in Blood, but pretty creepy to say the least. It raised the hair on my arms on quite a few occasions. More paranormal though, as it's not only about ghosts, but demonic possession as well. Apparently it's also a YouTube web series I believe, I'm still yet to check it out as well. Eeek, this is already so interesting to me, already. I didn't know this had a youtube adaptation too... or was this adapted from a youtube thingy? But anyways, I really, really like horrors so I'm so going to try this one out. Scaring me isn't a requisite... I just want to be creeped out again! I think the YouTube series came first, then was adapted into a book. Either way, this was such an awesome read Faye. There's one scene involving a bathroom at night that completely freaked me out. I can't wait to see what you think of it! I actually haven't heard of the Youtube Series either, but if it could freak you out I am definitely intrigued. Just checking it out now on Google to see what it's all about. SUnshine sounds like a quirky, unconventional character. Great review Kelly! She is, but as much as I loved her character, sadly she still strays into the general young adult tropes as well. Not too often thankfully, and the romance takes a backseat as well. It's a great read Jeann, I hadn't expect to have enjoyed it as much as I did. Really surprised me.